Above: Starting the day with a hike into the hills outside of the city of Gyöngyös. 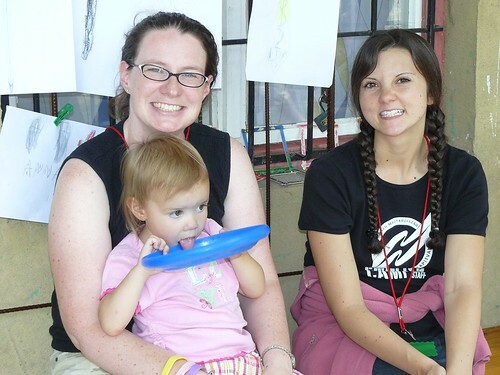 Above: Part of the PI team (Cathy and Jenn) coming to help with teaching and watching over the kids for the day. Above: DezsÅ‘ having opportunity to talk about faith in Jesus Christ along the way. After scattered showers and thunderstorms throughout the week, God provided a beautiful day for a one day church retreat in the mountains on the outskirts of the city of Gyöngyös. Above: Jonatán, a church planting pastor who oversees a Baptist church in Gyöngyös and in the town of Jaszberény, met with Miki and I a few months ago with a vision to see our churches interact on a deeper level, using our unique giftings to minister to one another. 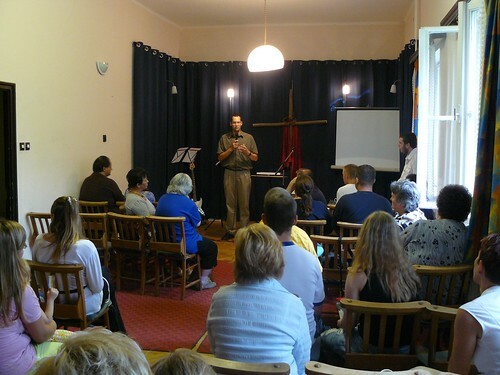 It was our hope, that this day would lead to a greater perspective of God's work in Hungary, as these church plants are full of first generation Christians in areas where there are scarce amounts of evangelical Christians. Above: DezsÅ‘ sharing the amazing story of God's grace to save him from a failed life of trusting in himself, to a new life of peace with God through Jesus Christ. There were also non believers with us today from each of the church plants. Pastor Jonatán shared at the end of the day how the testimonies of those from PetÅ‘fibánya in our worship service and also in our small group discussions later in the day were drawing others to consider the claims of Jesus Christ. Above: Our drama team from PetÅ‘fibánya. 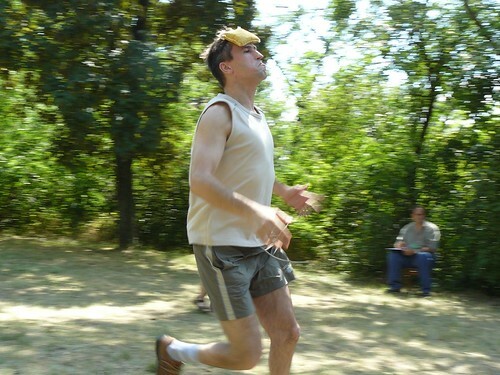 Niki (above) playing the role of a sinner running to Jesus for deliverance. 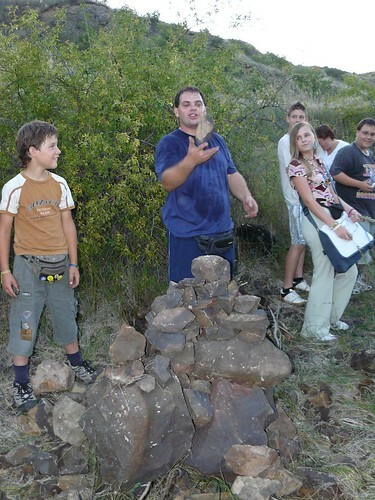 Above: Church members, Hugi and Gábor from PetÅ‘fibánya. Hugi and Gábor helped in a small group for those interested in the Christian faith this afternoon. One of the non believers commented to pastor Jonatán how it was easy for Jonatán to believe since he had a heritage of a father and mother who also believed. This person went on to say that it would be impossible for him to believe without any Christian heritage. At that moment, Hugi and Gábor began to give testimony to their atheist family background and how they had come to believe in Jesus Christ. Hugi and Gábor went even further, expressing their deep love for the local church and how important it is for them. These testimonies that were happening throughout the day in conversations on the hike and in small group studies truly encourage me. 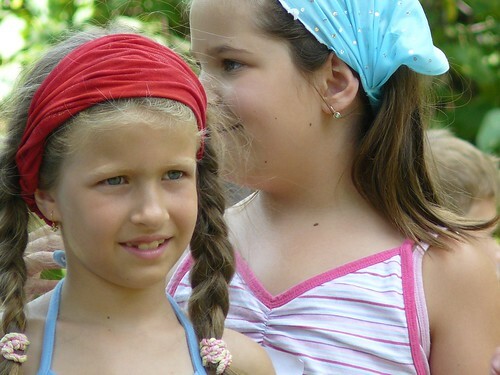 God has caused the seeds that were planted six years ago in PetÅ‘fibánya to grow. The members of our church are not only growing in their faith, but they are extending ther outreach beyond PetÅ‘fibánya. Praise God! 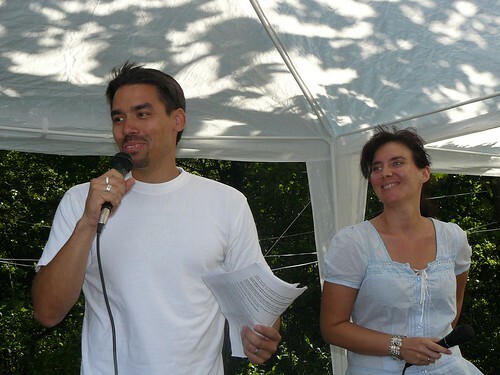 Above: At the end of the day, Allen was privelaged to be able to preach about the Christian calling with the help of new team member Edina translating. 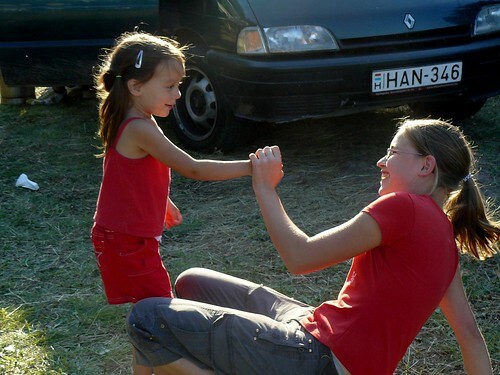 Above: Elianna playing with Eszti, who first came to know us through our VBS. Eszti and her friend Kitti have begun attending our church since last week and we hope that as they see the work of God in our lives and hear the message of salvation through Jesus Christ that they too will believe and be saved. 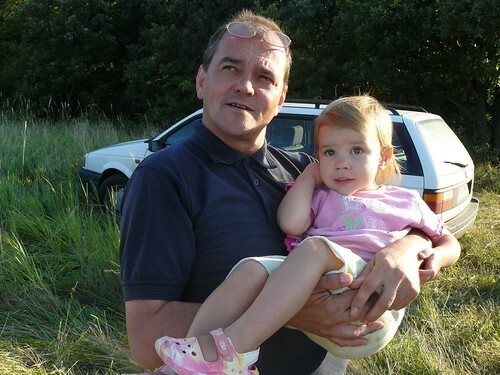 Above: DezsÅ‘ and Kira watching the gliders in the sky above the small airport field. Above: What we most desired to see today: Members from various churches unified in prayer for one another. 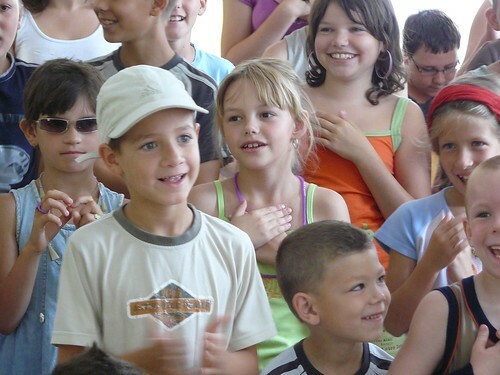 Above: Our Hungarian partners in ministry express their gratitude for those of you who have prayed for healing for their seven year old daughter Anna (above). Anna was released from the hospital today. All blood tests and observation revealed that her health is steadily improving. She will continue on an antibiotic at home. We praise God for protecting her and providing the care she needed through your prayers and through the local hospital. 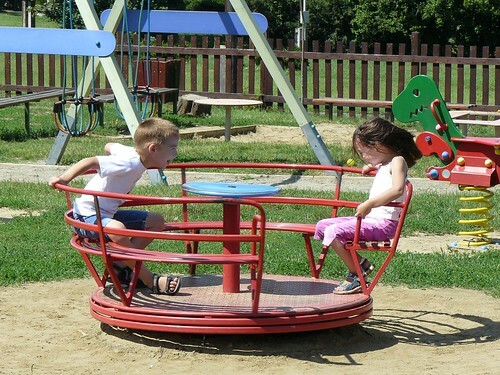 Above: Ben and Ellie a few days ago at the local playground. They are very happy to have Anna home again. Above: Kitti and Eszti seen above at Friday’s Teen Ministry came to church tonight! For many people, one of the greatest challenges is to break through the initial fear barrier of stepping foot into church for the first time. Kitti and Eszti already got to know many church members at our VBS and also through last week’s hike and last Friday’s game night. After church, teamate Brenda and Sharon invited them to our house this Friday night as well. We are so grateful for being able to follow up after VBS and having a new balance of teen girls and teen boys involved in the life of our church. Please pray for God to do a gracious work in their hearts and to give them understanding of the Gospel. Above: Tonight, Istvan Jr. (ee-sht-von) also visited our church for the first time. 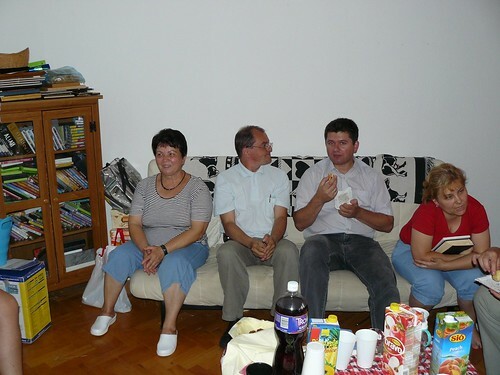 His father, Istvan and mother Marika attend many of our other ministries, including our marriage Bible study. The whole family visited our church after many months of ‘almost’ attending (something always came up). 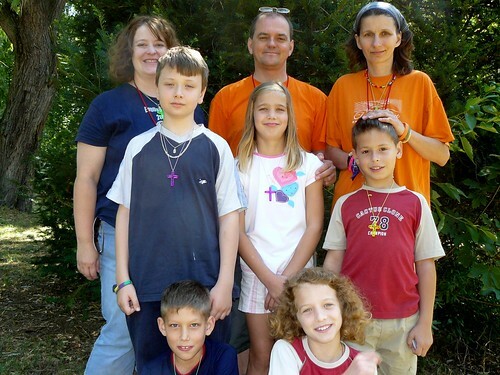 Marika is a very mature Christian and is seeking a church home for her whole family. 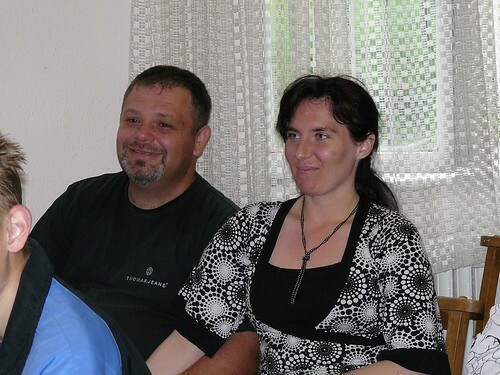 They have four kids and live in the neighboring town of Zagyvaszantó where we also hope to do church planting work in the future. 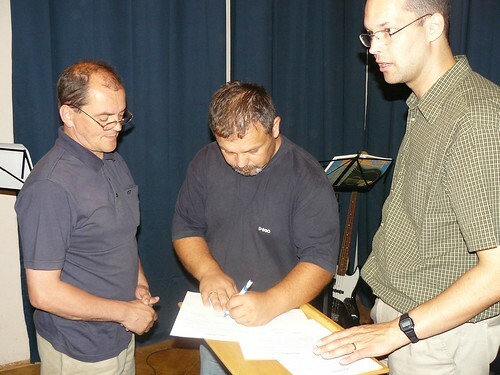 Above: Pastor Jonatán from a larger city in our county called Gyöngyös came to oversee our church’s official vote to become united with the Baptist Church in Hungary. Though we believe we are already established in God’s kingdom as a local body of believers, we beleive it is wise to be officially recognized by the governement and the community as a Baptist Church. This serves as a legal protection for our local congregation and has also brought various blessings to us. Those church members who were present signed a paper stating our intent which will be presented to the Baptist Church leadership for approval. Baptist Church Leaders have already spent adequate time meeting and praying with us as we go through this process. We are blessed to have their support, not only in establishg this local church, but in pursuing our vision of church planting. Above L to R: DezsÅ‘, Peti and Jonatán. DezsÅ‘, who preached tonight on Romans 5 and the blessing of justification by faith through Jesus Christ continues to use his giftings to bless the church. When the time is right, it is our desire to see DezsÅ‘ become an elder in our church. Peti continues to seek God’s will for provision in his life as a pastor. Please pray for God to completely provide for him and to give him and his wife Edina direction as to the next steps to take. 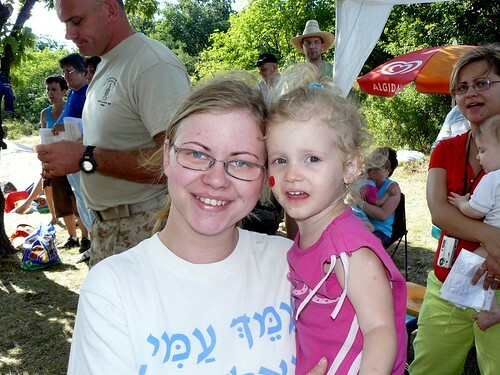 Above: Our Hungarian partners in ministry, Miki and Erika had to take their daughter Anna (above) to the hospital on Saturday. Anna was suffering from a high fever and unique rashes that turned out to be pinpoint areas of bleeding under the skin (petechiae). These are very disconcerting symptoms and Anna will remain in the hospital for treatment and observation. They ask for your prayers for healing for their 7 year old daughter. Above: Pass that hoop before time runs out! Once again, those who attended VBS a few weeks ago joined us in our Friday Teen Ministry. In contrast to three years of only teen boys attending, tonight there were a majority of teen girls. Before the night ended, some of them began asking when and where we met for church. They said they would come this Sunday. Please pray for these teens to be saved from their sin by putting their faith in Jesus. Some of these teenage girls have known us and attended various outreaches for years, but have never attended church service. Pray that they truly would come this Sunday to church and that they would experience the presence and power of God in our service. 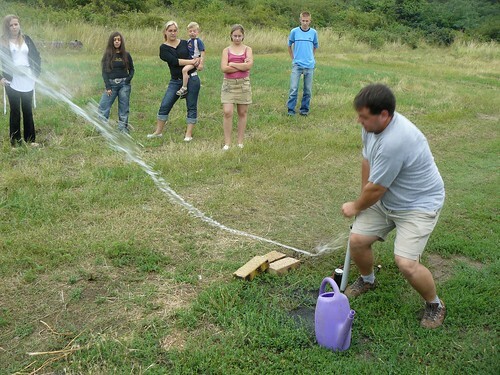 Above: Miki launching a rocket fueled by water and air pressure. Above: Fitting as many people as possible into a very small circle. Above: Longtime church attender GyÅ‘zÅ‘ also came tonight. Unfortunately, as GyÅ‘zÅ‘ grows into his teen years he is showing more signs of outward rebellion. One of the other teen boys tonight who also visits our church, Dávid is a strong influence in GyÅ‘zÅ‘’s life. Neither of them has many good male role models in their lives, and I am sure they have a greater number of friends influencing them to go down paths of destruction than friends encouraging them to follow Jesus. Please pray for these teen boys to have a change in heart, and to truly see the importance of knowing Jesus as Lord and Savior in their lives. Above: Old friends Vera and Tamás that we served with years ago in Budapest dropped by to participate in our marriage Bible study tonight. 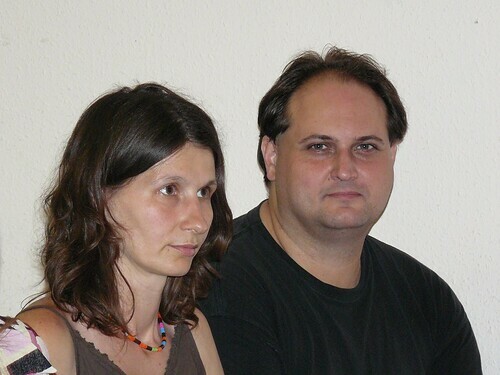 Vera and Tamás are also involved in church planting in Budapest. They are expecting their third child next week. Above: We had three married couples and three married women that came without their spouses. Every time we meet, we see the importance of holding these classes. 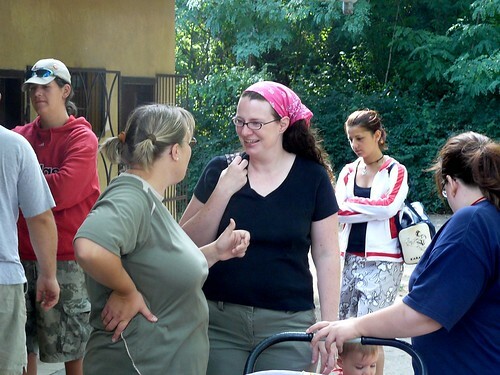 Generation after generation in Hungary have passed on wrong thinking about marriage and bad patterns in marriage. It is a blessing to have the Bible and to understand God’s will in marriage for husbands and wives. We broke up into separate groups tonight with Sharon leading the women and Allen leading the men’s study on Ephesians 5. We were blessed to see each person’s input, honesty in sharing struggles and the opportunity to pray for one another. It is always a good sign to see people linger and continue with one on one conversation after the study time ends. God is developing a true experience of fellowship. Above: We were very thankful for teenagers Zoli and Niki who were gracious to watch the kids tonight. They do an excellent job keeping them happy (and us happy). 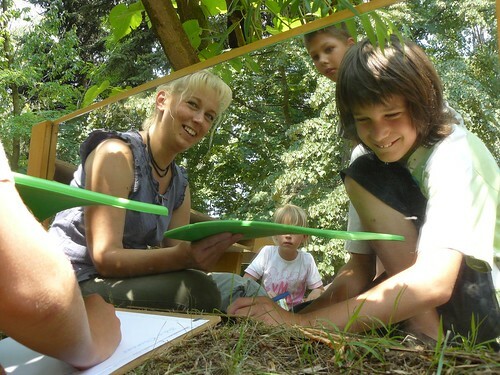 Above: Sharon with Kira and Erika with her youngest, Bence. 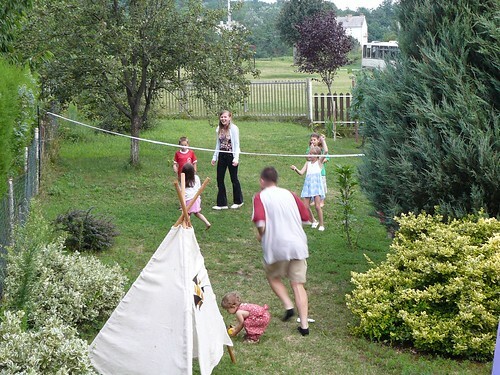 Above: The latest fad for the Mercer kids is to dress up with their friends and take turns performing majestic dances. Tomorrow we are planning our Friday teen outreach ministry. Please pray for us to have wisdom in planning and for God to use our time tomorrow night with the teens to help them understand Jesus. 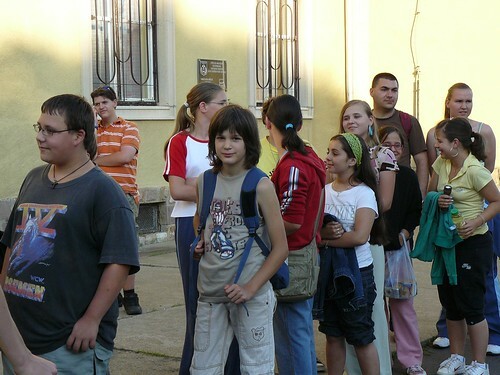 Please also pray for teenagers Gabi K and Zoli who will be helping in the planning and carrying out of this ministry. Above L to R: Julika’s children, Dávid and Mani sitting with Dezsô in the 90 degree late afternoon heatwave. Mani was a tremendous help in organizing our VBS a few weeks ago. 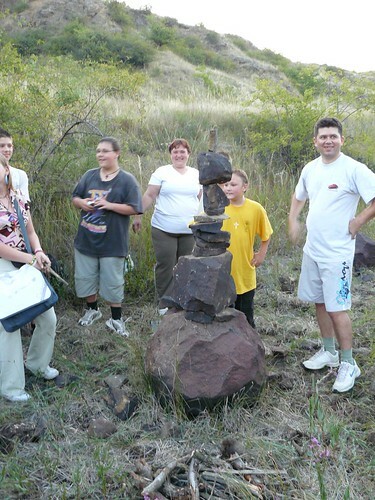 Mani and Dávid also joined us on our hike on friday and are helping maintain friendships made through VBS. 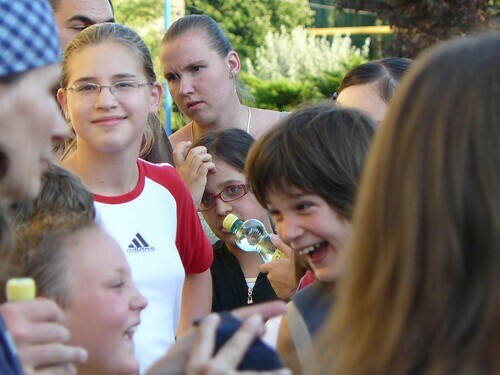 Watch out DezsÅ‘, Ben looks like he is up to something behind you. Above: I have no idea where these kids came from but they came. Sharon and I happened to be responsible for children’s Sunday school tonight and it was a joy to have new visitors (young visitors) to our church sing with us, learn about Jesus and feel welcomed. Above: Photo of Peti and Edina taken a few weeks ago. Peti continues to preach God’s word every other week and is taking on more responsibilities in the leadership and founding of the church. We are grateful for his heart to see a revival in Heves County and for his relevant teaching that builds up the body. Unfortunately, Edina was sick on Sunday. Please pray for complete healing. Both Peti and Edina are seeking God’s will in what next steps to take in determining work and ministry commitments. Please pray that God would give them wisdom in this time and provide for all of their needs as they have a desire to serve in PetÅ‘fibánya. Above: Hugi and husband Gábor. Tonight, after church we celebrated Gábor’s birthday. I was just talking with him last week and was very encouraged to see his growth in Jesus Christ over the past year. 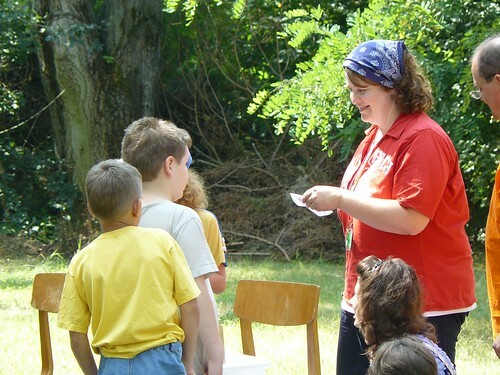 The VBS ministry often serves as a memorable marker as to where someone was in their faith and how they have progressed. 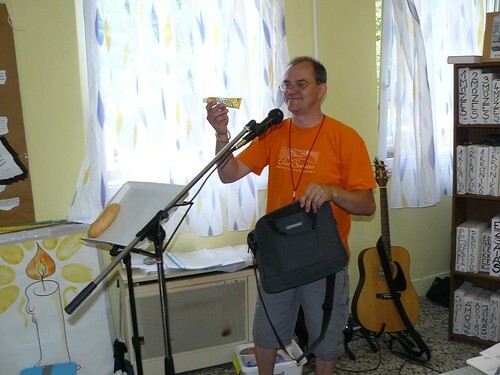 I can remember at last year’s VBS that Gábor came to lend a hand. He had started seeking God, but was not yet a Christian. 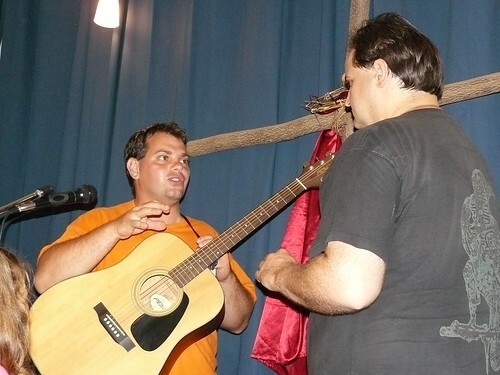 In this year’s VBS he came as a brother in Christ. 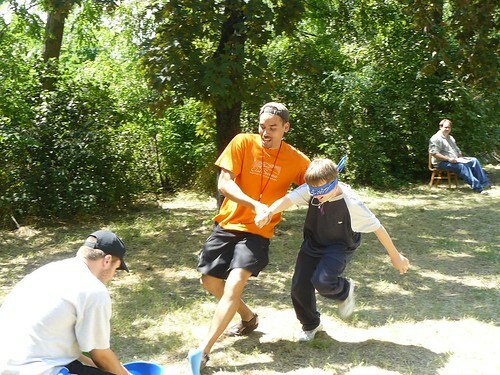 He also came to help under the direction of God, as the Lord led Gábor to give up something he once truly thought important to invest his time serving in VBS. It is clear that Jesus is doing a gracious work in his life and his wife’s life. Please continue to pray for these young believers to become founded in God’s truth, and coming into a greater understanding of God’s love for them through Christ. Above: As a way to follow up on new relationships made through our VBS last week, we planned a hike for teens on Friday night. VBS ended last Saturday, and we were thankful to see one teen, Orsi attend our worship service after getting to know us through VBS. 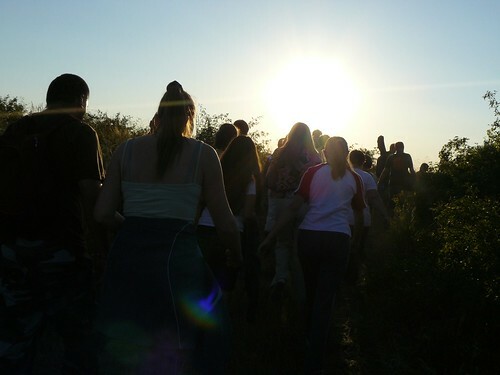 We weren’t sure what the turn out would be on tonight’s hike, but the new faces outnumbered those who regurlary attend our teenager outreach on Friday nights. 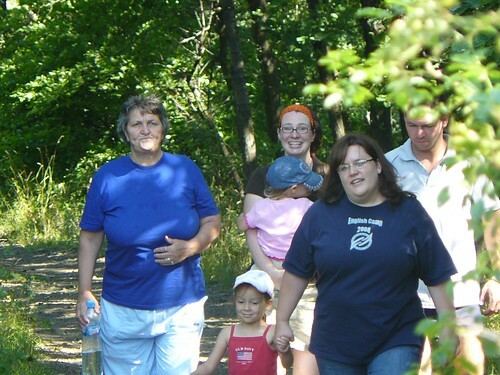 We had over 30 teens and also parents join us for the hike. 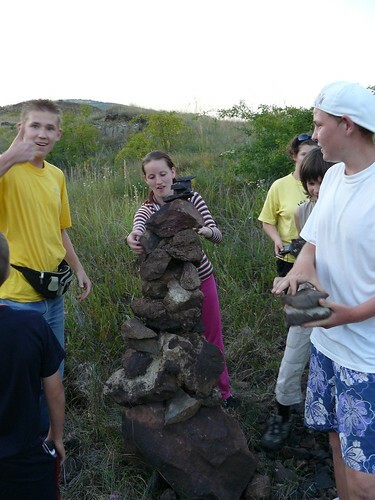 Above: Rock tower competion. 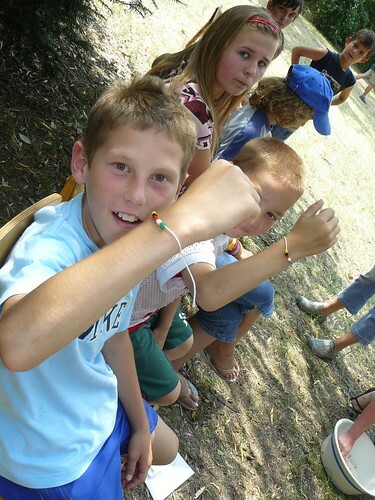 Máté (above) attended our English Camp a few weeks ago, but we lost contact with him soon afterwards. We were thankful that he showed up for tonight’s hike. 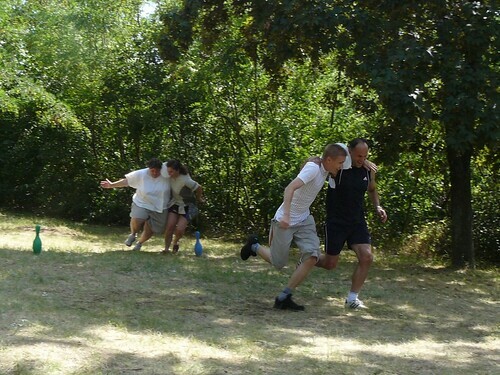 In multiple teams, we did various games that helped peope get to know each other. It was clear as night fell, that friendships were developing. 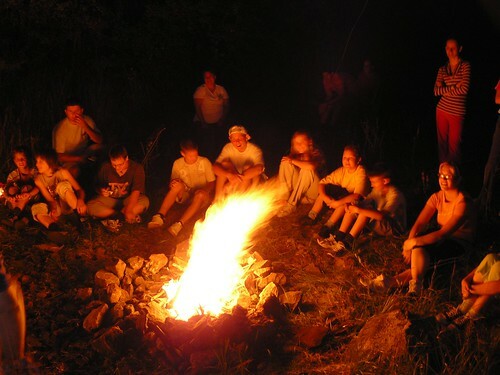 Above: After game time, we settled down around the fire for hot dogs and marshmallows. This is the time we use for evangelism. 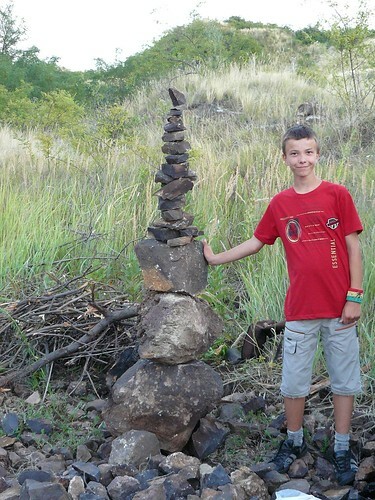 As teenager Gabi K. continues to grow in his faith, we are entrusting him with opportunities to serve. 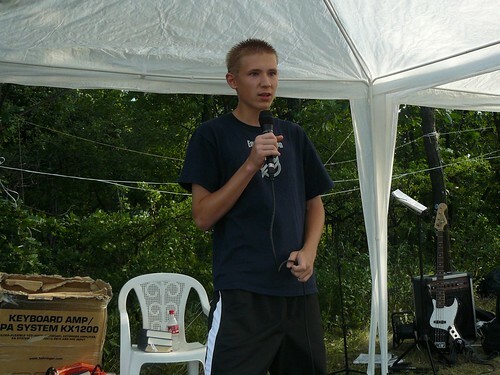 He did an excellent job in last week’s VBS teaching a small group. Tonight was his first opportunity to lead a discussion time. Gabi focused on the question of the meaning in life, using Ecclesiastes as his guide. The conversation led to an opportunity for DezsÅ‘ to give testimony as to the shift in what he now considers life’s purpose. 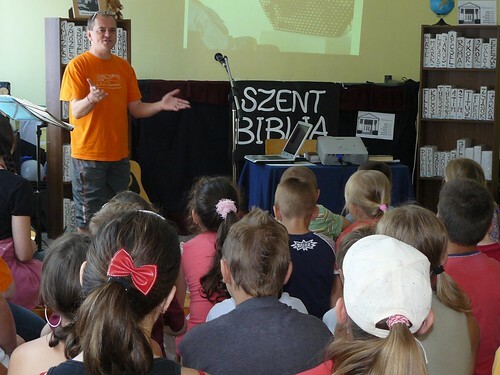 The kids (and parents) became very attentive when DezsÅ‘ shared how he lost everything in life, and became an alcoholic for some time. He shared about how God rescued Him and how God’s word and Jesus became the source of light and deliverance in his life. Above: One of the couples that came that most likely was able to hear testimony of how Jesus saves for the first time. Szabi (above right) is from the same town as DezsÅ‘. We hope that some of these teens and adults will respond to our invitation to church tomorrow. Please pray for them. Above: What we had hoped for all week...responding to a special invitation, we had a number of parents join us today for our last day of VBS. Above: Val presenting today’s main teaching with Heidi helping at her side. Heidi is responsible for most of the art and visual aids that we used throughout camp. With all the parents paying attention in the back of the room, Val reviewed what we learned throughout the week. The parent’s got to see their children recalling Biblical truths and reciting scripture from memory. 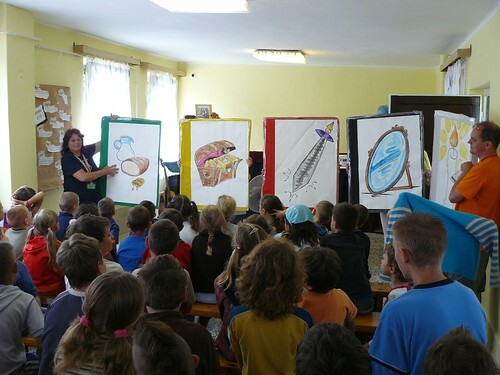 Val also did a great presenting today’s teaching in Hungarian and used different colors to bring the kid’s attention to the truths of the gospel. Above: Peti led todays Bible study for the parents who joined us today at VBS. He talked about the misconception many people had about entry into heaven being based on our merit rather than on Christ’s merit. There were many who were appalled at the thought that a murderer could get into heaven if he truly repented and put his faith in Jesus Christ for salvation (criminal on cross, Saul). Peti sought to help them see that we are all sinners in need of Jesus Christ, and we are all in desperate need of God’s gracious gift of salvation only found in Him. It was clear that many of them were hearing the gospel for the first time. Above: Hajni with son Attila. Hajni was very active in today’s Bible study for parents. She asked honest questions and expressed why she struggled to accept what she referred to as religion. 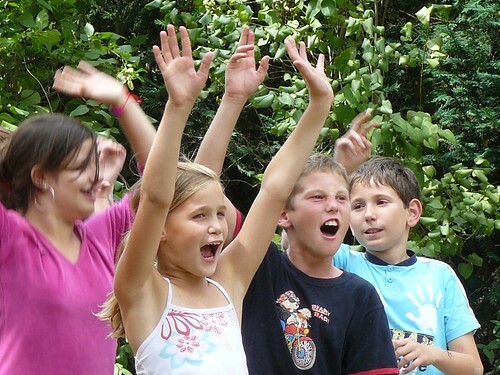 Above: Deepening friendships at camp. For the past two years, Patrik (above right) has been a handful to deal with. Even though we had to be firm with him this year, his disobedience brought us to be more focused in praying for him. Today, towards the end of the main teaching in the morning, Patrik was one of the kids who volunteered to say Scripture from memory, and he was able to do it successfully. We pray that God would get a hold of his heart and transform him into a man of faith that brings glory and honor to Jesus Christ. 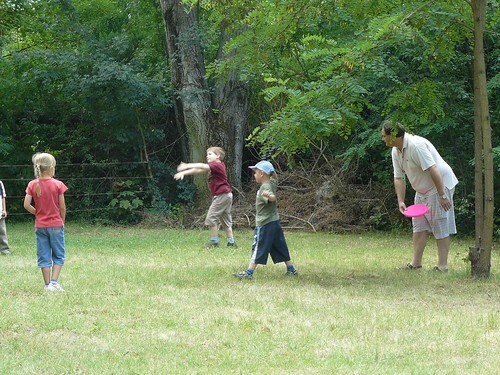 Above: The parents had a great time competing in the same games we had given the kids throughout the week. 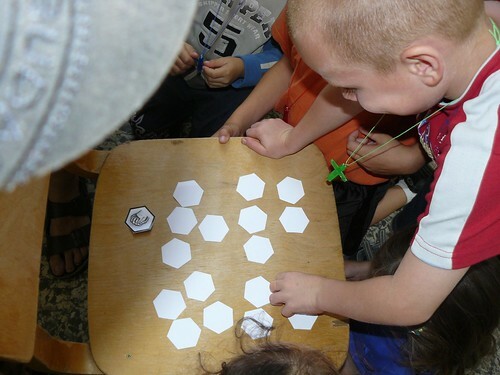 Above: Each child was given this memory puzzle for a take home gift. This puzzle is just one in many ways that Julika who wrote most of the material and prepared the theme for camp helped us to keep the truths taught this week resonating in the children’s hearts. 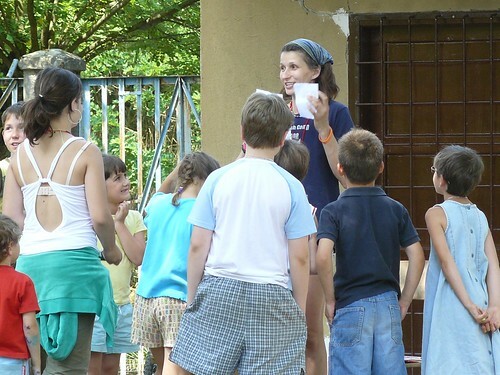 We are so thankful for Julika’s investment at home (in the midst of chemotherapy) to help us carry out this VBS in a way that brought honor to God helped children to truly understand the gospel. Above: Teenagers Zoli and Gabi did a great job presented our final object lesson. Gabi stumbled into the room wearing a completely stained shirt with names of sins written all over. After trying to get it clean in a bucket with detergents labeled ‘going to church’, ‘good works’, and ‘prayer’, Zoli came to help by explaining that Jesus was the only One who could help. After putting his faith in Jesus, Gabi pulls the once stained shirt out of the bucket, to reveal that it has become completely clean. - Many parents came today and heard the gospel in the main teaching and in small group time. 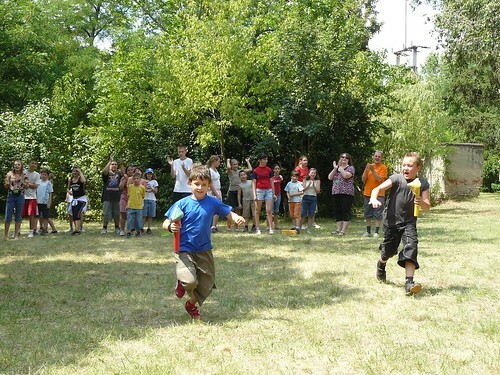 - While in various parts of Hungary it was raining, God provided cool sunny weather for our entire day of VBS today. - New connections and relationships have been built. We hope to see some of the kids and parents visit church tomorrow and also hope to see many of the teens come to our night hike on Friday. - Those that visited had a great time as we lifted up the name of Jesus. One visitor, Eszti shared that the mini-drama and the teaching today really spoke to her and that she would definitely return next year. - Val’s teaching and Gabi and Zoli’s mini drama clearly communicated important truths. - Though there were the expected misunderstandings and break down in communication throughout the week, team members were responsible in quickly seeking restoration and forgiveness from each other. God provided unity and love for one another throughout the week. 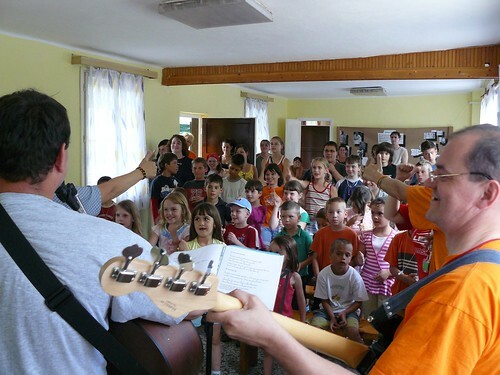 - Praise God that many members of the local church in PetÅ‘fibánya played important teaching, organizing and helping roles in VBS this year. Thank all of you who committed time to pray for us and for those attending VBS this year. We truly sensed God’s presence and His mighty work in the hearts of these young kids. Many seeds were planted that we believe will bear fruit! Above: After Miki’s excellent teaching on God’s word being necessary to nourish our souls like food nourishes our bodies, Val reviewed the week’s memory verses. 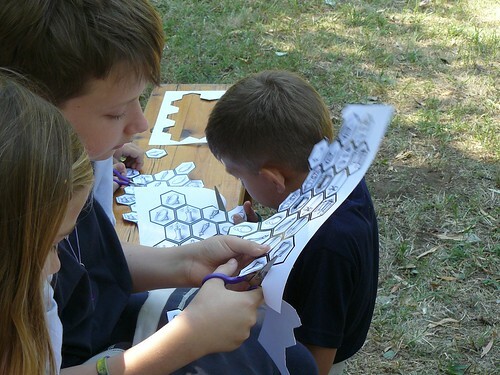 There are clear signs in the small groups that the children are really understanding the main teaching each day. They are able to explain why the Bible is like a mirror, why God’s word is like a sword. Each symbol refreshes their memory and each verse they have learned reminds them of an eternal truth. 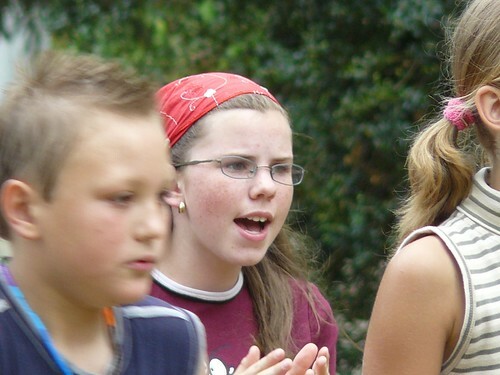 One of the leaders reported that camper Sára shared that she truly believed all that we have taught about Jesus. Above: Robin asked for Gabi’s help at free time to learn the books of the Bible. Even though Robin doesn't know how to read, he was really interested in learning the books of the Bible and the verses from this week. Above: Dori, seen cheering at game time, was able to recite all the verses from the week and all of the books of the Bible from memory. 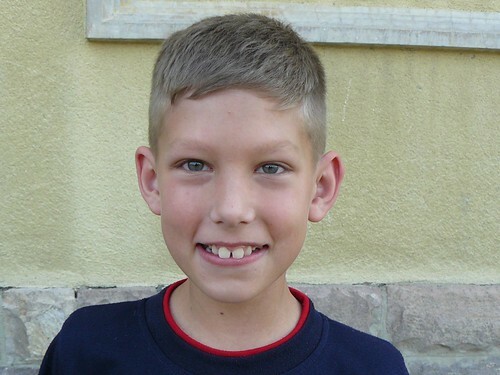 Above: Dávid, (who just came to VBS today) is one of the teens I have often had to send out of our church service for being disruptive and disrespectful. About three weeks ago, he was so rebellious when I sent him out of church that He stood by the open window as I prayed and began making disruptive noises. I had to threaten to call the police for him to stop. Last week, he showed up again to church and I was able to have a private talk with him about my desire for him to come, but my passion to protect our time set aside to worship God from disruption. I gave him another chance and invited him to help me with the children’s Sunday school class last week. He did an excellent job changing his attitude and I made sure to encourage him and tell him how proud I was of him. 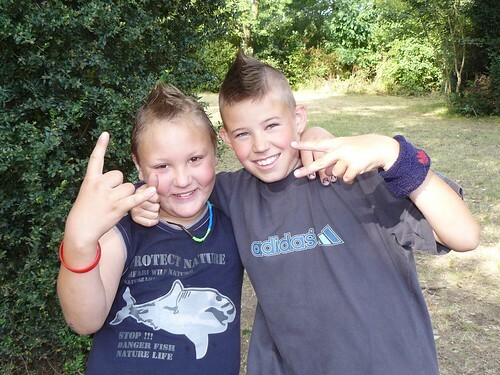 Just yesterday, DezsÅ‘ saw Dávid as the kids were walking home from VBS and DezsÅ‘ invited Dávid to come today. With Dávid’s history of stirring up trouble, many of us were paying close attention to see how he would do. 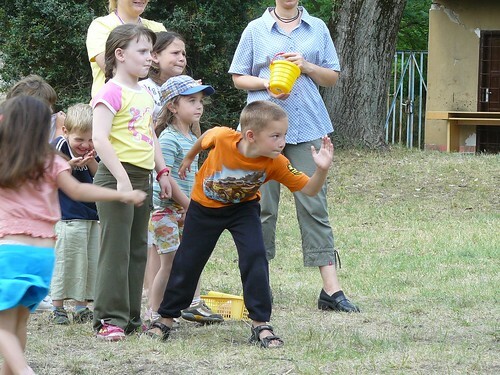 Brenda reported that she saw a real fight escalating between two boys at the back border of our camp grounds. She said she saw Dávid come over and convince them to stop fighting. Dávid did not initially see Brenda, and when he saw that he was ‘caught’ doing something good, he seemed embarrassed. We praise God that although we have had to discipline Dávid in the past, he recognizes that we truly love him and he finds acceptance as a person in our presence. Above: Ben ready to blast off into a sprint at game time. Last night there was a violent storm that woke most of us up around 3:00. We praise God that He sent sunshine for the kids to be able to play outside today! 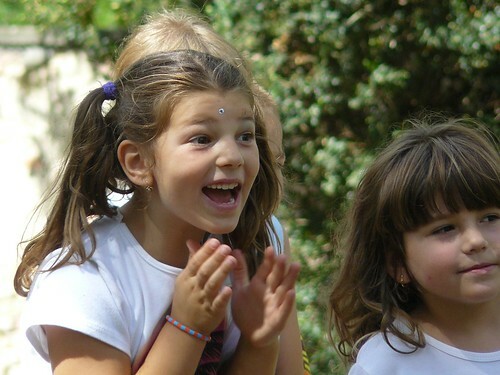 Above: Anna cheering on her team. 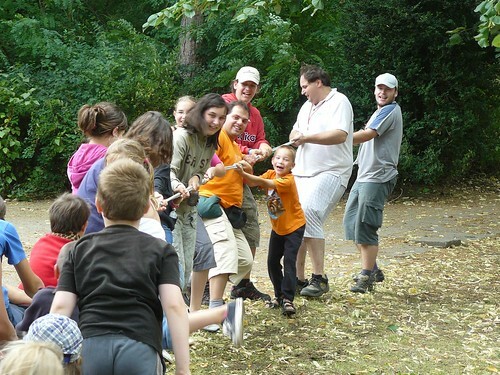 Above: Some fun with tug-of-war. Above: End of day object lesson taught by DezsÅ‘. the deaf to hear, the lame to dance. Whether He loves you or doesn’t is no longer a question. Look what He did for you, He came willingly. Whether you believe or not, you have to know what He did. God loves you, what more could He have done for you? Above: Miki reports that the teens in his group have formed friendships and they are very interested in joining us on our hiking trips that we have begun this summer with the teens. Please pray for us as we plan to use these night hikes and campfire discussions as a way to follow up and continue to reach out to these teens. - Allen struggled through the day feeling weak, but is now feeling much better. 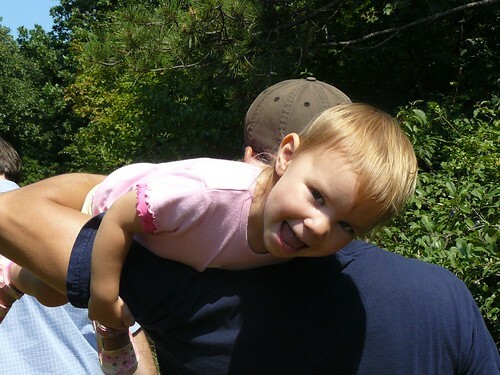 - All those serving at camp seem to have had abundant energy for the day. - God continues to maintain our team unity and love for one another while serving together. - Various kids are either revealing their faith in Jesus, or showing interest in learning more about salvation in Jesus. - Both Miki and DezsÅ‘’s teaching time went well. - God cleared up the weather after a violent storm last night. The kids were able to be outside in cooler, comfortable weather most of the day. - With the help of others, Sharon was able to pull together a 4th of July party for all those serving at camp. Hajni also came to the party and was able to listen in on conversations about how we live out our faith in Jesus day to day. Specific requests FOR OUR LAST DAY OF VBS! 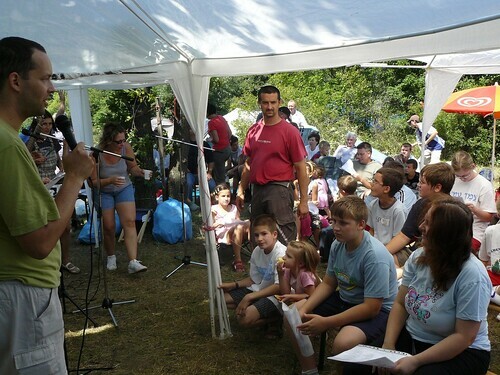 - Pray that many parents would come and have an opportunity to hear about Jesus at camp tomorrow. 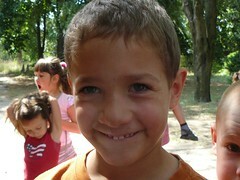 - Pray for Peti who will be leading the Bible study for parents who may be hearing about Jesus for the first time. - Pray for God to direct the weather to be most effective for His plans for tomorrow. - Pray for connections and relationships to be built. - Pray that Jesus Christ will be glorified through all that we do and say as a team tomorrow. That as our guests see our love for Jesus Christ and for each other that they may also glorify God. - Pray for Val who will be presenting the main teaching tomorrow. She asks specifically for prayer for her ability to communicate in Hungarian clearly. - Pray for Gabi and Zoli as they present the end of day object lesson about the only way to get the stain of sin out of your life. Above: Build your life on solid ground, by allowing Jesus Christ to be it’s foundation. As the week progresses, more and more kids are singing along and doing the motions as the songs have become more familiar. 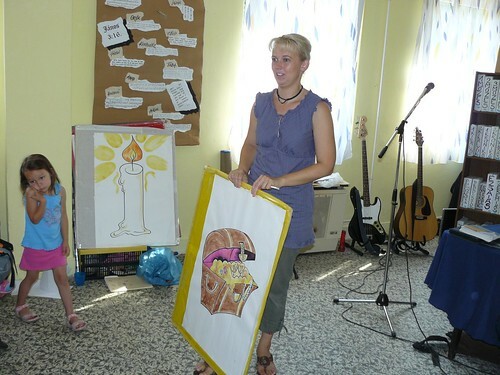 Above: Erika teaching on the treasure found in Christ. The kids were captivated by her teaching and were quick to learn today’s memory verse. Above: DezsÅ‘ and Rachelle’s small group. We saw an improvement with behavior today as we set out a clear explanation of our expectations that we respect one another and also that patterns of disruption and disrespect of leaders will lead to being sent home. 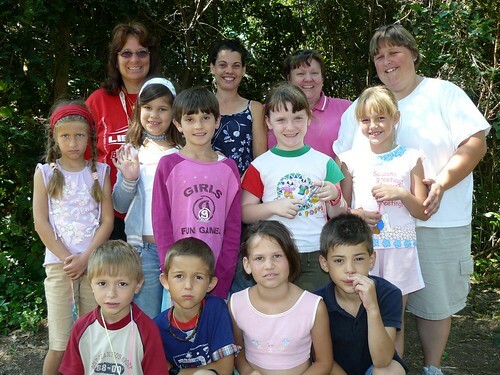 DezsÅ‘ reported that initially the same kids began acting up in his small group. He called them forward and had everyone pray and ask God to help them with a change of attitude. 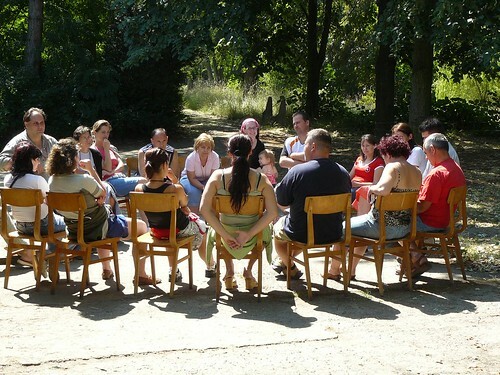 God answered and DezsÅ‘ said the discussion in his group soon led to each person showing a serious desire to put their faith in Jesus Christ. Just prior to small groups, Erika had shared about Jesus being the greatest treasure in life and Val shared her personal testimony of how she made the decision at a young age to trust Jesus as her personal Lord and Savior. This morning’s teaching made an impression on DezsÅ‘’s group. After DezsÅ‘ triple checked whether they understood and were serious about their decision, he led them in prayer. Each child in his group prayed out loud for salvation in Jesus. Please pray for those who have made this eternal life changing decision that their faith would mature in Jesus and that the enemy would not distract them from following their Savior. Above: Today we mixed up all the teams that had been playing together for the past three days. This allowed new people to work together, and older kids to help younger children. It was a joy to see them helping and encouraging each other. It was also a blessing to hear many of them recite each Bible verse from each day from memory. Above: Val posing questions about each day’s teaching. 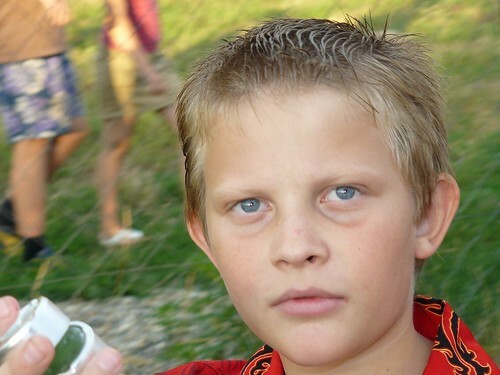 Above: Tomi showing his gospel bracelet, with each color representing a truth about the gospel. Above: Part of the competition involved drawing symbols from this week’s teaching by looking through a mirror. Above: Making friends at camp. Above: Fun at craft time. These frames will be used to house a picture of each child to take home. Above: Miki’s end of day object lesson. Initially, there was no room in Miki’s backpack for his Bible as it was stuffed with a scooter, a piano, games, racquets and other things to fill up his time for his trip to grandma’s house. The kids helped him to reorganize his priorities and pack his Bible in the bag first, which required him to leave some other unimportant things at home. - Allen is feeling better (but not completely) and all of us had enough strength to serve through the day. - Those who were ‘acting up’ had a change in attitude today. 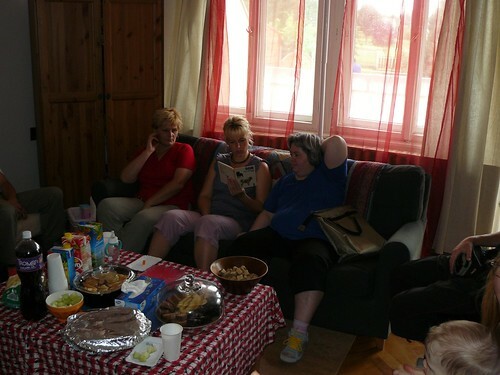 Some of them in DezsÅ‘’s group prayed for salvation in Jesus Christ. 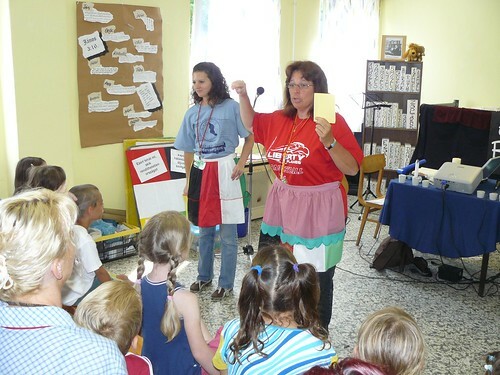 - Both Erika and Miki’s teaching went well. The kids payed attention and there was evidence throughout the day that they understood what was presented. - Weather was great (still no rain!). There were mild injuries, but nothing major. There have been no sicknesses leading to kids being sent home. Kids are showing signs of understanding the gospel message. - Complete healing for Allen and teenager Gabi who are sick. Protection of Zoli’s body from the dangers related to a tic that was removed last night. 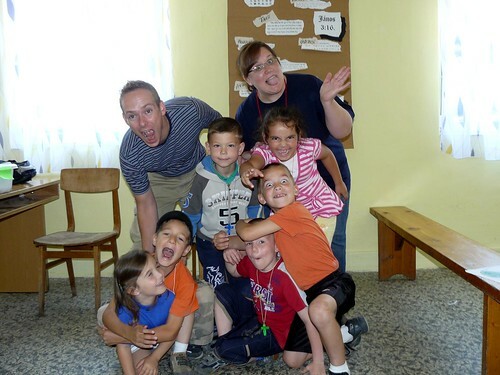 - Please continue to pray for good rest for VBS workers as we are exhausted by the end of each day. Pray for refreshed spirits and bodies so that we could wholeheartedly serve these kids. - Pray for team unity, patience with each other, love for one another and good communication as we near the end of VBS. - Pray for the kids as we are close to the end of camp that they would be drawn to Jesus and choose to put their faith in Him for salvation. 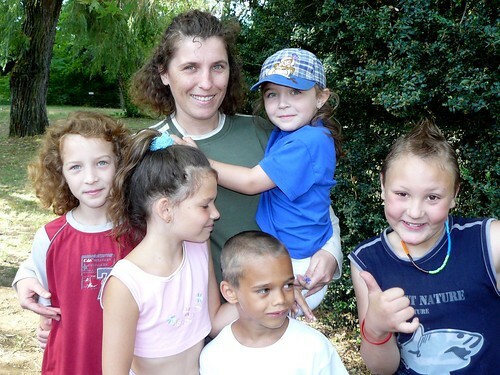 - Pray for the parents who will be receiving invites from their kids tonight to Saturday’s end of VBS party. We hope to see many parents come and build relationships with them. 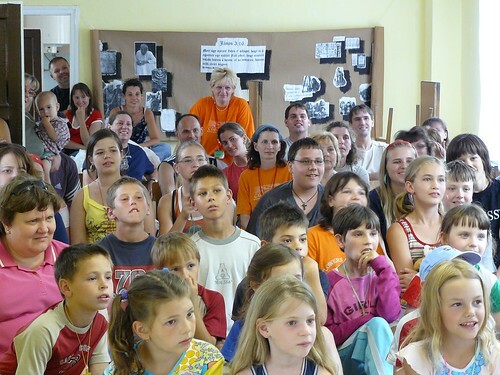 - Pray for Miki who will be presenting the main teaching tomorrow and for DezsÅ‘ who will be presenting the closing object lesson. - Please continue to pray for the proper weather, freedom from injuries and sickness, wisdom in teaching, and for the kids to truly come to understand the verses we have been learning throughout the week. Above: DezsÅ‘ presented today’s teaching on the power of God’s word that brings light into our lives. 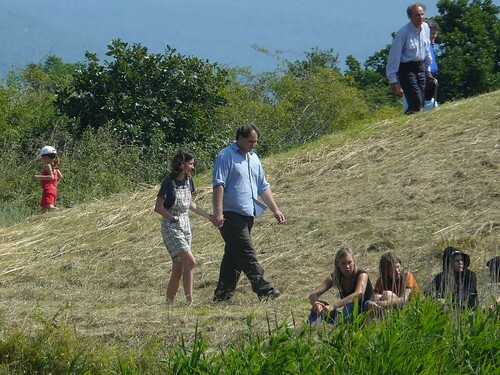 Above: Teenager Gabi and Roger’s small group. Gabi continues to do a great job for his first time leading such a small group. Above: Edina lead the adult Bible study and Hajni did come for the first time (mentioned in previous blog). We talked about how we respond in times of need and how God’s word and His promises have helped us in these times. It was encouraging to hear so many tangible evidences of God’s work in various people’s lives from the unexpected provision of diapers to a poor family, to provision of money for a house for another family in need. I was thankful that Hajni stayed for the entire discussion and study. Above: Hajni and her son Attila. 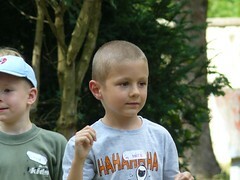 Attila seemed to have a great first day at VBS today. He was attentive in class and enjoyed game time (especially playing with Ben). Above: Praise God that there have been no major injuries througout camp. We are also thankful for none of the kids becoming dehydrated in the hot weather. So far, no kids have had to go home due to sickness or injury and that often happens by this time in camp. Orsi who had an mild asthmatic attack yesterday was completely fine and even played soccer with us. 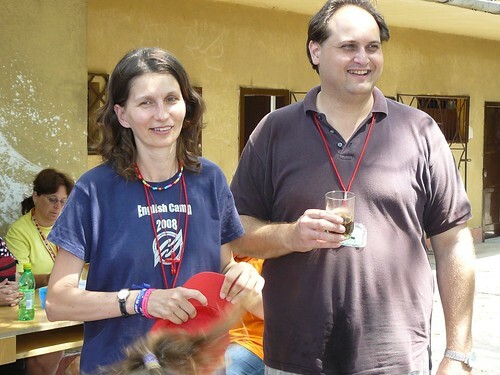 Above: Church members Hugi and husband Gábor have been such a help at camp. Gábor has been sleeping at the camp grounds to watch over all of the equipment every night. In this area of town, there are many problems with people stealing things. Last year, the fence we installed for camp was stolen soon after camp ended. Above: Mani giving the end of the day object lesson on being light in the world for Jesus. Above: Each day, we try to give the kids a little gift to take home. Today it was bubbles. Looks like the leaders are having more fun than the kids. 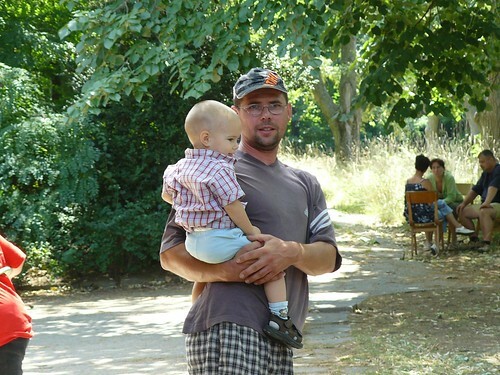 - Máté and Kitti (mentioned in last blog) seemed to have a better day today. 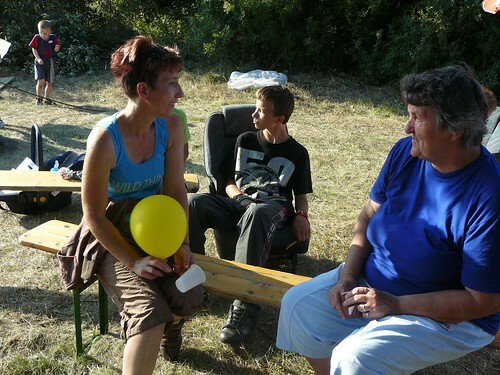 Teenager Zoli who is helping us in camp had a talk with Kitti about her behavior in small group time. Kitti seemed to be leading the others into disobedience when the topic was more serious. Later, Kitti told another camp leader how Zoli talked to her and that she decided that what Zoli said was right. It is great to see Zoli having an impact on the way the younger teens think. - Edina did a great job with the Bible study for the adults. Hajni attended and heard faith stories from various Christians in the group. - DezsÅ‘’s teaching time went well. - Allen is still very weak from being sick. We are halfway through VBS and many of the leaders are feeling a bit fatigued from the intensity of each day. Please pray for healing for those who are sick, rejuvenating rest tonight and EXTRA strength for the new day tomorrow. 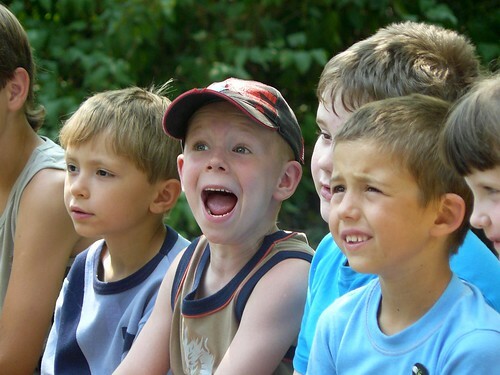 - There are a number of kids that are starting to cause disruption in small group studies. Today was one of the worst as far as keeping their attention. Please pray for us as we will lay out new disciplinary actions tomorrow morning and will speak personally to those who are disrupting teaching times. Please pray specifically for those who are ‘acting up’ that hey would come to understand the gospel and put their trust in Jesus Christ for salvation. - Please pray for Erika who will be giving tomorrow’s main teaching in the morning and Miki who will be giving the closing object lesson. Above: Children payed close attention to Miki’s teaching today on the sword of the Spirit which is the word of God. Above: Miki did a great job captivating the children with various illustrations as he taught. He also highlighted how Jesus successfuly used God’s word as a sword when the enemy tempted Him in the desert. Above: Val and Janet continuing today’s teaching in their small group. As you can see, the weather has cleared up, and we enjoyed the sun and a cool breeze throughout the day. Above: As the children split up into different groups, we also hold a Bible study for the adults who are either helpers or just attending camp. 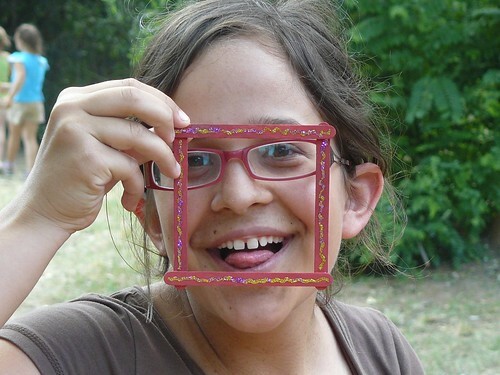 Tomorrow, we hope to have a woman named Hajni join us for the first time at camp. Please pray for her to be free from distraction and drawn to God in this Bible study. Hajni has visited our church and various other Bible studies over the past year and a half. 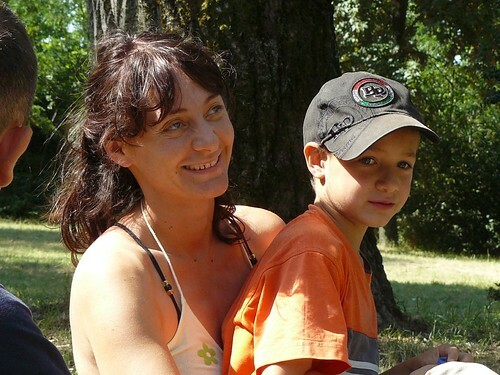 Her son Attila attended preschool with Ben. Above: Miki’s small group. Miki reported that he had a good discussion today, but the teens (mostly girls) are still reserved in sharing their thoughts about spiritual truths. He continues to ask for prayer for his group that they would open up in discussion time. Orsi seated far left above (red baseball cap) came to play soccer with us at free time. In the midst of the game, I noticed her knelt down on the sidelines. She told me that she had trouble breathing and chest pains. We found out that she struggles with severe allergies (maybe even mild asthma). In this time of distress, I was able to pray with her. Jesus took care of her, and she was fine the rest of the day. 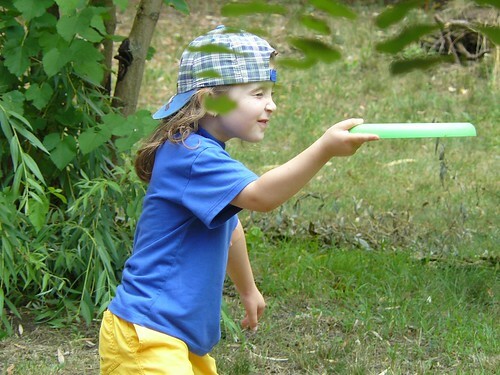 Above: Eyeing the target before the throw. 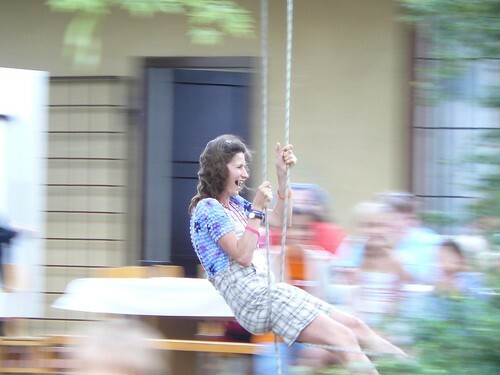 Above: Hugi putting her life in Miki’s hands as she tries out the tree swing. Hugi brings a lot of joy to our team and to camp. Unfortunately, because of her partially paralyzed hand, and because of her ‘up front’ role in helping with songs and motions, some of the older boys began to make fun of her just before the day was over. Hugi was in tears and immediately wanted to meet with all of them. She said to me, “I just want to let them know that I love them.” Tomorrow we will talk with those making fun of Hugi. Please pray for our conversation with them. 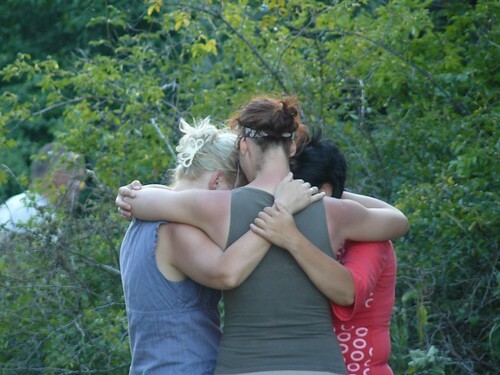 Pray also for Hugi to find comfort from the team and from her Savior when she is rejected by others. Above: I wonder who’s team won that round? Ben was not only excited for camp today, but we also celebrated his seventh birthday. Happy birthday son! 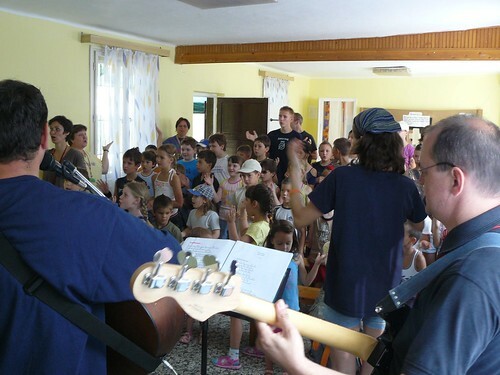 Above: Zoli and Gabi performing a min-drama before the kids return home. Gabi told me he prayed a lot before his teaching time as he was really nervous. Gabi did an excellent job teaching and the kids were very attentive while he spoke. - Team members had strength for the day. 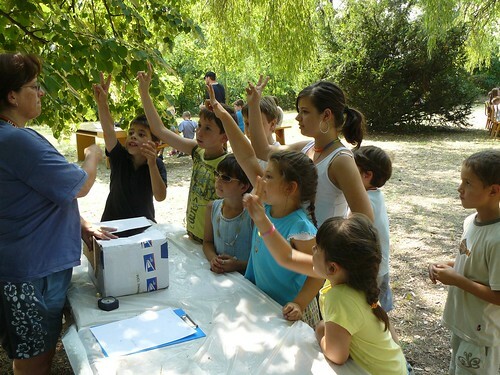 - Miki’s main teaching time was successful and Gabi and Zoli’s mini-drama at the end of the day helped strengthen the day’s lesson. - The weather was beautiful. - Children are paying attention in small groups and showing signs of understanding the important spiritual Biblical truths. - Please continue to pray for Allen. After leading soccer today, he felt very sick again. There are others who are complaining of sore throats and headaches (the way that Allen’s sickness started). Please pray for healing and protection from sickness. 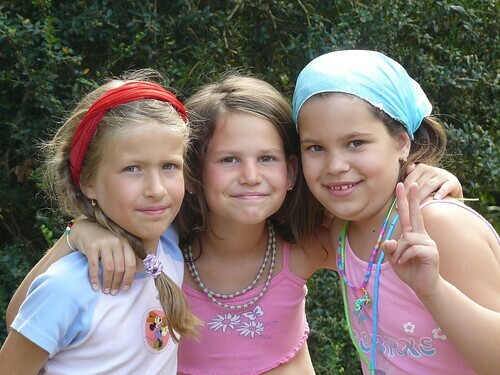 - Please pray for Máté (left) and Kitti (far right), two campers who are having a tough time connecting. Máté is a senstive child and we have found him a few times in tears for various reasons. We would love for him to have a more enjoyable time. This is Kitti’s first time at VBS and she seems to be opting to not participate in games and other group activities. Please pray that we would have wisdom to know how to love Máté and Kitti and that they would have a much better day tomorrow. 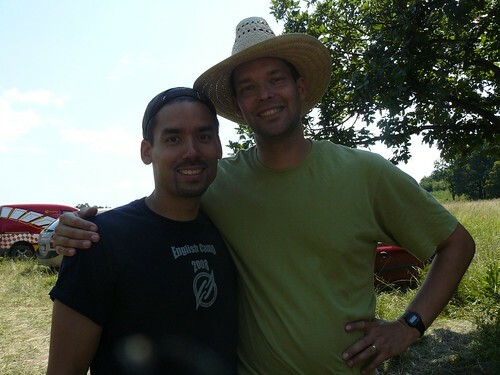 - Allen is handing the baton to Edina who will be facilitating the adult Bible study tomorrow. Please pray for Edina as she leads this study and for Hajni who will be a first time visitor to the study. - Rest and strength. There are lots of activities throughout the day that cause all team members to be spiritually and physically tired. Please pray for a good night’s rest tonight and that God would provide the strength that each team member needs to serve Him wholeheartedly tomorrow. - A few teens are causing disruption in our worship time. Please pray for them. 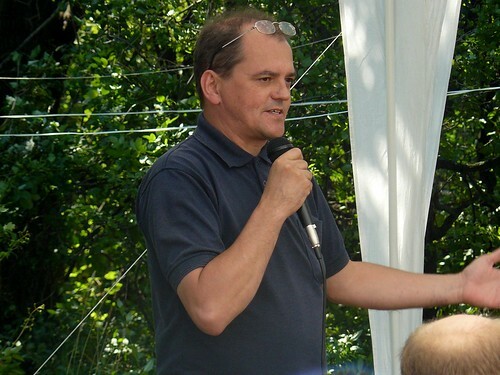 - Pray for DezsÅ‘ who will be presenting the main teaching for the day. - Please continue to pray for the children, who in most cases come from homes without Christian parents and with limited opportunity to hear the Gospel and worship God in community.